I absolutely love talking beauty and skincare and everything in between with anyone who will listen. 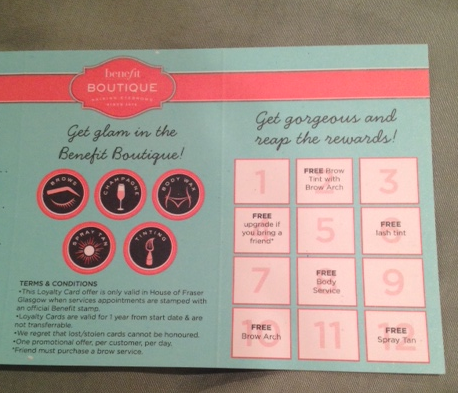 Even better than that though is talking about it with someone as interested and passionate about it all as I am, and that is just what I found at the launch of the new Benefit boutique in House of Fraser Glasgow. Obviously at a beauty blogger event you would expect me to be in this situation but it was actually the staff members I was caught up talking to on this occasion. I had a million and one questions ( no seriously, I was relentless) about the fact they now have private rooms for waxing and spray tans and I was just blown away with the level of care and attention they are offering in their new home. Alongside their famous brow wax and tints (absolutely no-one can give me an arch as good!) you can now choose from a whole host of treatments just like you would at any salon and for absolutely fantastic prices too considering the level of service they are offering. I love that the private rooms they now have means if you are a little shy about having a facial area waxed or shaped you can now opt to sneak away from the shop floor, or if it is your first time and are a bit nervous there is somewhere you can go and relax while having it done. The staff are so well informed on the techniques and products they are using and have really listened to customers and what they want- making sure the experience is absolutely flawless for every customer no matter what treatment they are going for. I was bowled over with the prices too, for instance a Brazilian wax is only £26 for hot wax or just £20 with strip wax which is a huge markdown on many places I have been, the Vita Libera spray tans they offer in a range of shades are only £20 and on top they offer a fab loyalty card service which gains you bonus treatments along the way! Having staff as interested in the customer experience really made me think about how many places I have visited where this is just not the case and how sad that seems on reflection. 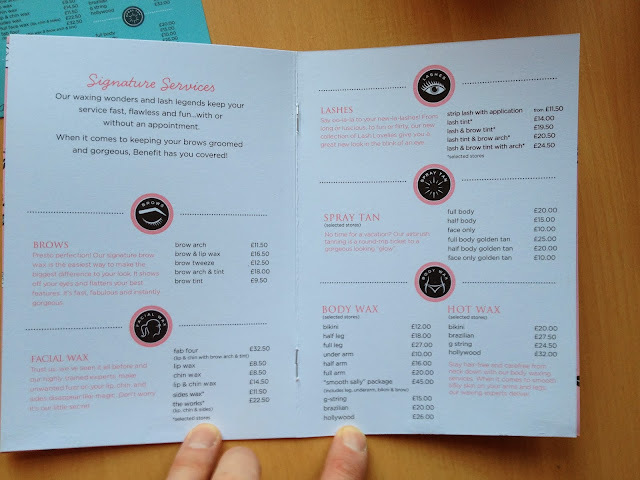 I can’t say I have ever really been ‘excited’ about getting a wax but with that staff passion combined with the lovely retro-feel surroundings they have created, I actually can’t wait to give these services a whirl! Benefits new boutique in House of Fraser means they have really been able to spread their wings on what they can offer. This space, that is of course still jam packed with all their amazing products, goes much further than the make-up which is something I love and was super impressed with. Of course if it is their make up that is your favourite thing then they having something for you in their new boutique too. 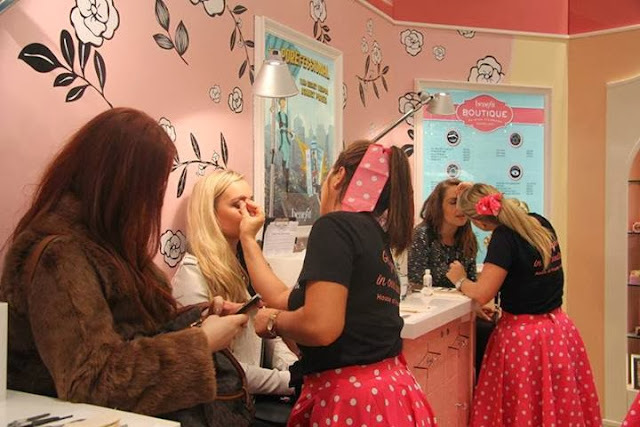 You can book in to their adorable VIP section for only £12 which gives you a full make up lesson, mini bottle of Moet AND a Benefit product to take home, I think this is such a fab idea and perfect for a pre-party pamper or even teen girls who are new to the whole thing. If you are in Glasgow I cannot recommend going and checking their new home out and having a peruse of all that they offer, the Benebabes there are so lovely and welcoming, you will feel right at home! fresh brow wax and tint! 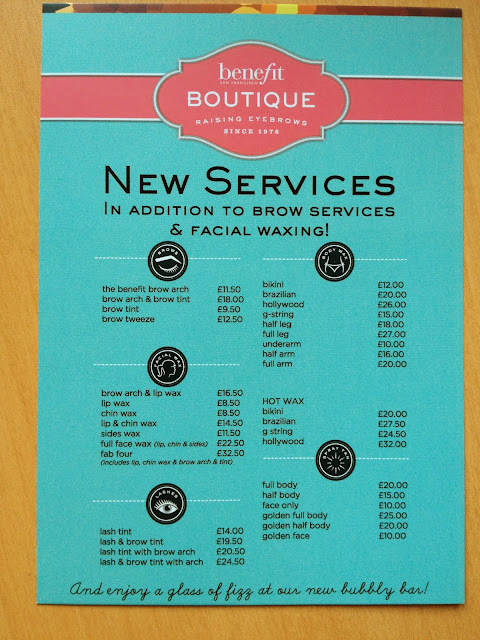 If you get in quick and book any of their services like a £12 brow wax before the 4th of December, you get ANY body service free which is such an amazing offer just in time for the Christmas party season!